MDIS Experience Grand Prize Winner Febryna Soetedja embarked on a journey to discover not only MDIS, but also the little red dot known as Singapore. It was a journey she most definitely will remember for a long time! Febryna’s personal guide, Jannah Shah, recounts the adventure they shared on their four-day trip together. 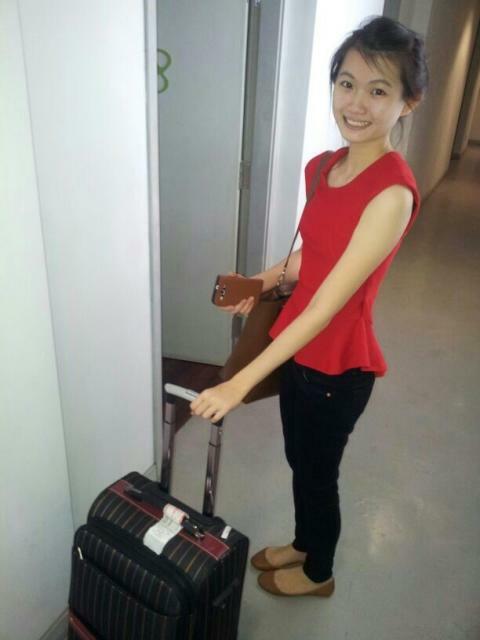 Febryna was all smiles when we picked her up from Changi International Airport, and we were pleasantly surprised to see her clad in red - the official MDIS colour! That’s one girl who knows how to dress to impress! After checking in at the Executive Suite of MDIS Residences@Stirling, we brought Febryna to Margaret Drive for lunch. It is a popular spot for our students to savour one of Singapore’s favourite dishes – Hainanese Chicken Rice. Up next, Febryna immersed herself into the arts and soaked in some culture at the National Museum of Singapore. The Singapore History Gallery exhibition struck a special chord with her; it presented Singapore’s complex history in a captivating way using modern technology. After a hearty Morrocan dinner at Bussorah Street, Febryna caught up on some much needed sleep in her hostel room, resting up for an action packed day that was soon to follow. It’s a good thing Febryna got a good night’s sleep because Day 2 was packed with fun-filled activities. First was a visit to Universal Studios Singapore. Febryna was looking seriously tuckered out after spending more than half a day at the theme park. But she was instantly reinvigorated the moment she heard what was up next, SHOPPING! Singapore is known to be a shopper’s paradise. From the best bargains and affordable goods at Daiso to high-end fashion brands, it can all be found in the heart of Orchard Road. It was the perfect opportunity to get some Christmas shopping done, and she probably bought enough to cover her Chinese New Year shopping list as well! “Think BIG, dream BIG, believe BIG, and the results will be BIG,” boomed Dr R. Theyvendran, PBM, Secretary-General of MDIS, as he spoke with drive and passion during his ‘Success is You’ motivational talk to students. Febryna seemed to appreciate his speech, as I observed her listening with a look of intense concentration. Day 3 allowed Febryna to experience student-life related activities such as a campus tour, hands-on lessons, etc. Febryna got a special all-access pass to check out the various state-of-the-art facilities in MDIS and we are confident that she was impressed! For her, the highlight of the campus tour was getting to see up close the beautiful dresses showcased at the Jakarta Fashion Week. Over an Ikea dinner of Swedish meatballs, Febryna lamented that she was having such a good time that she didn’t want to go home! It made me happy to hear that she was enjoying herself immensely, but it was also a little bit bittersweet knowing that she would be leaving the next day. On the last day of the MDIS Experience, we surprised Febryna with a bag filled with MDIS merchandise and a special picture montage of what she had seen and done over the last three days. It was a tear-jerking moment for me as I said goodbye but I am confident that we will meet again in the future. Febryna, you’re more than welcome to visit us anytime!